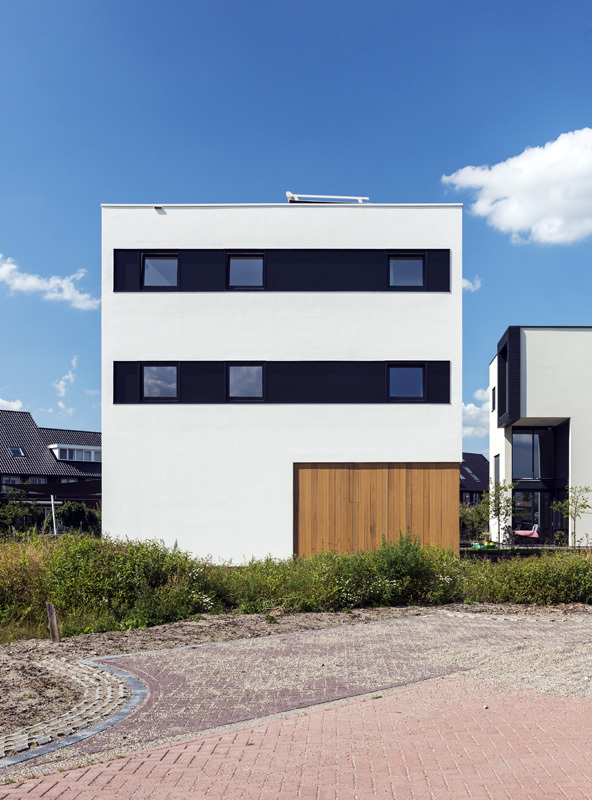 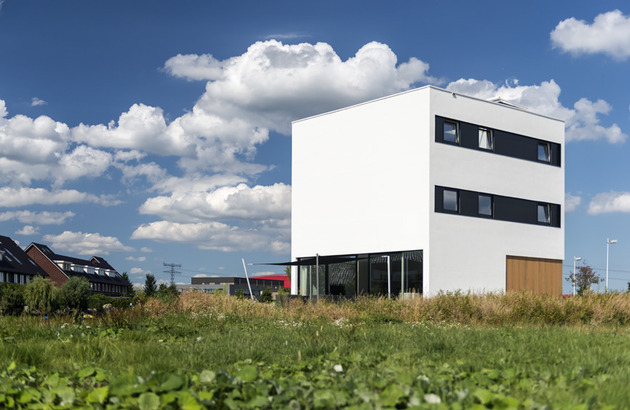 This modern cube house, along with others of the same shape form Cube Island, a suburb in Leidsche Rijn (the centre of the Netherlands) where all the houses are designed as cubes. 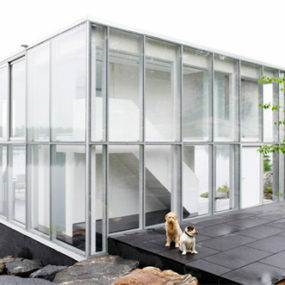 The idea behind the 10x10x10 House is to create maximum spacious experience within a simple cube shape. 123DV architects have divided the three-story floor plan into a narrow long zone of 2,5 x 9,5 meters and a wide zone of 6,5 x 9,5 meters. 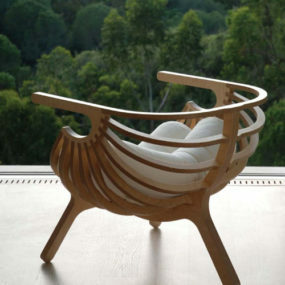 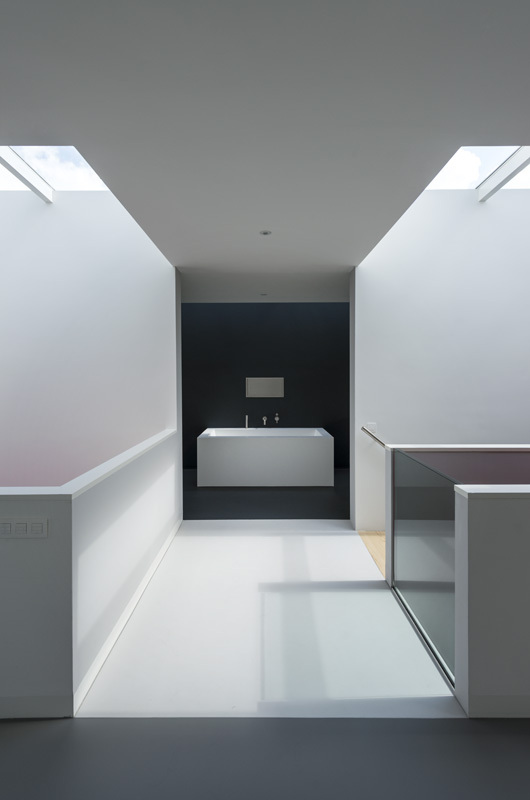 This result in outspoken places: intimate spaces for bathing and lofty spaces for living and sleeping. 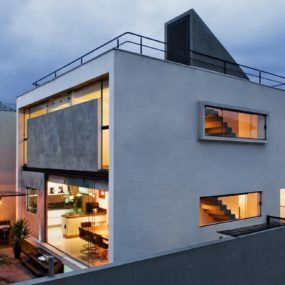 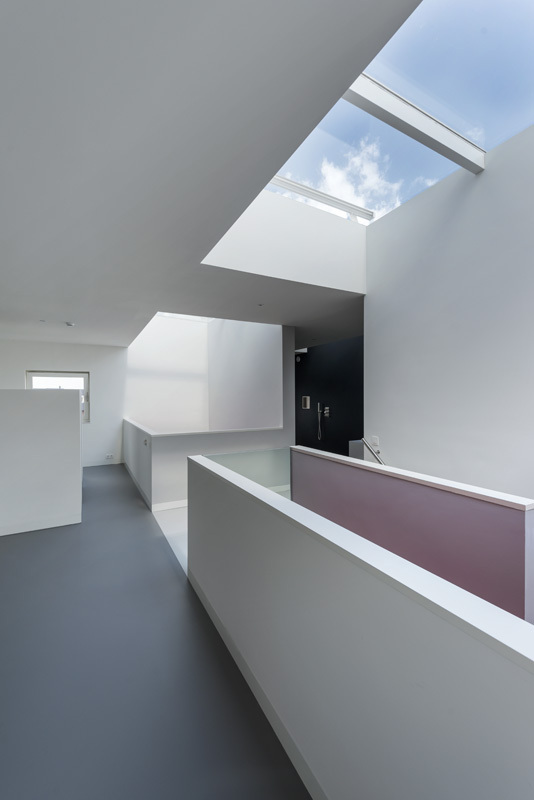 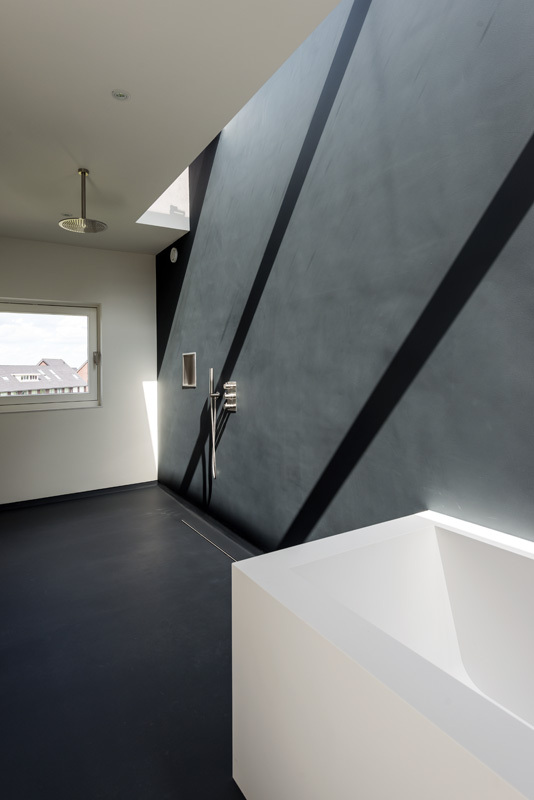 The void between the wide and narrow spaces is topped with a roof light. 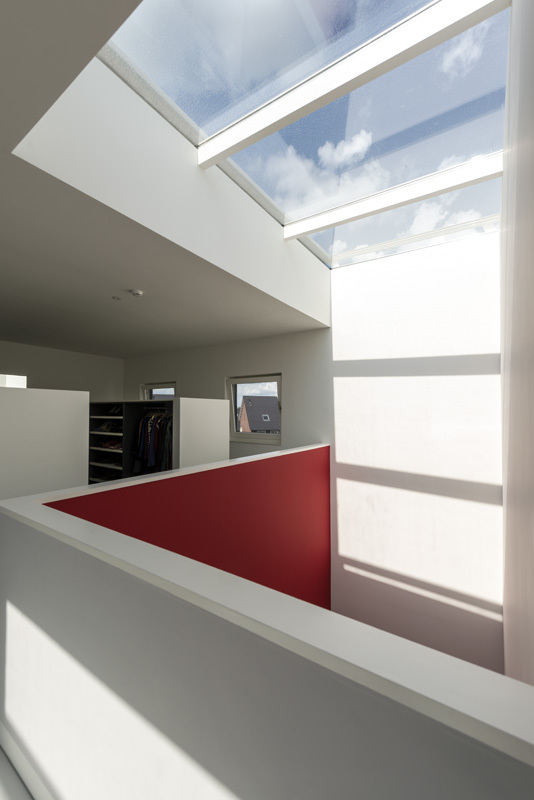 Sunlight can penetrate deep into the house. 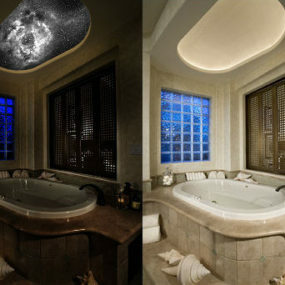 It also allows 10 meter views towards the sky when entering the living room. 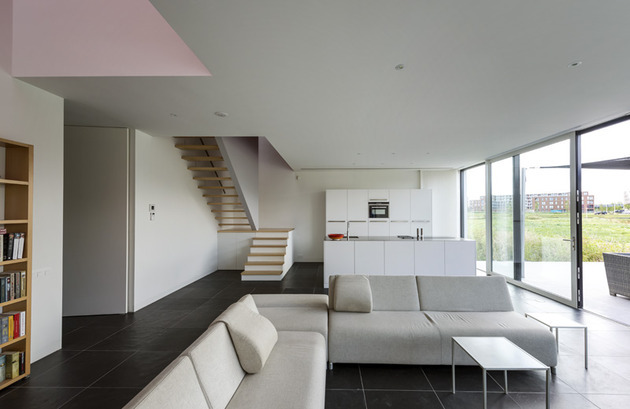 On the ground floor, the open space consists of a vast living area and of an open-plan kitchen. 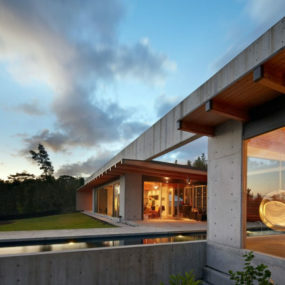 The light comes generously in through a system of sliding doors that run all along the facade. 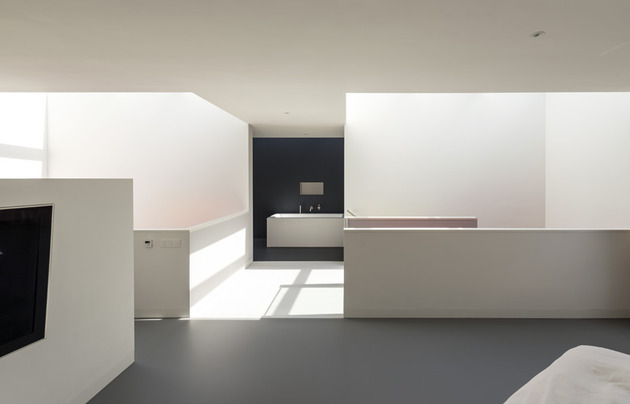 The kitchen is minimalistic and consists of a tall block set against the wall and of a same-length island, all in white. The big format dark floor tiles create a strong contrast with the white of the kitchen and of the walls. 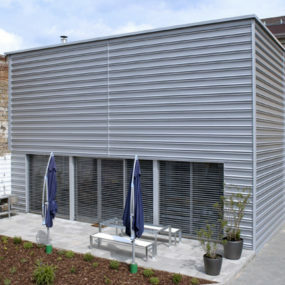 The sliding doors give access to a ground-level terrace which is set on a concrete slab. 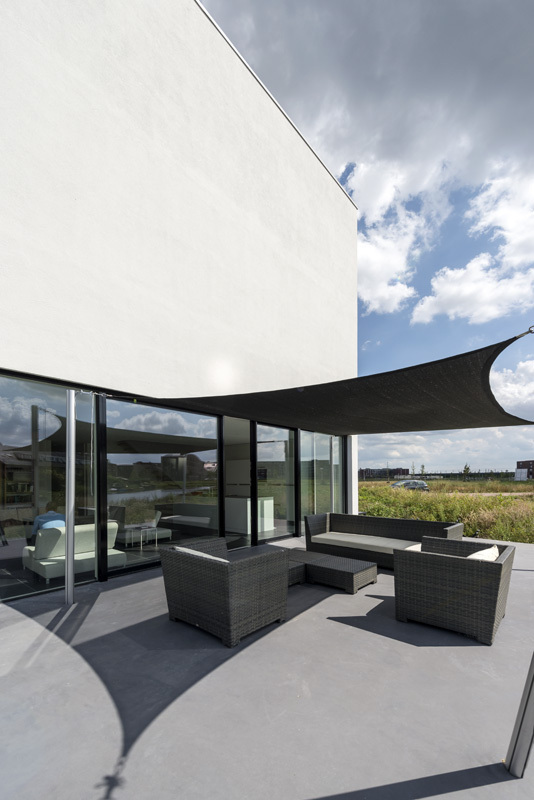 A sail-type shade is held by metallic pillars and it protects from the sun the only outdoors area of the house, as the upper floors don’t have balconies or terraces. 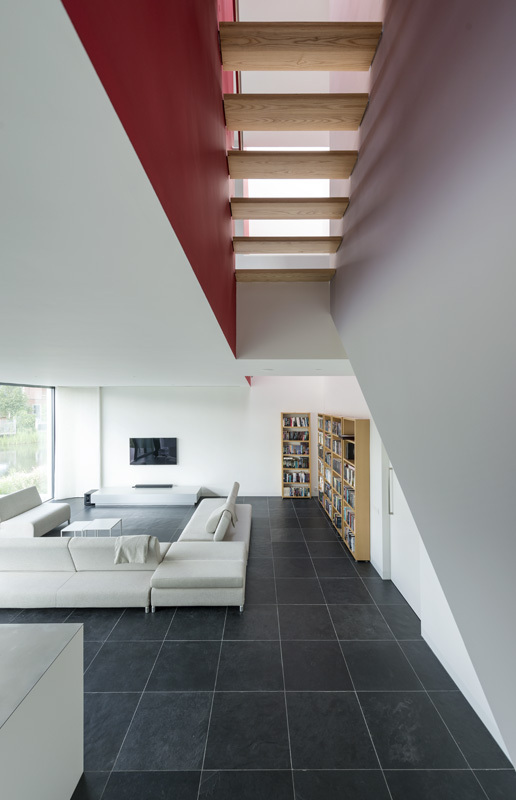 The stair and staircase are an important visual element of the house, as it lets the light come down from the ceiling windows. 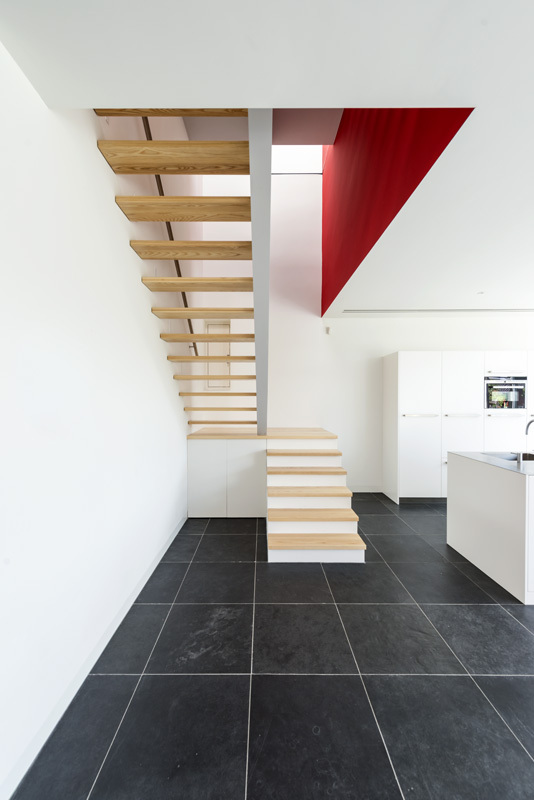 Although it’s set between walls, it has certain lightness to it given by the fact that the steps have no back side. 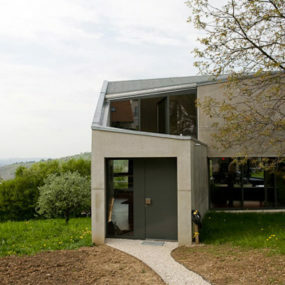 The steps are the only wooden element of the house, and they bring warmth to this otherwise colder looking concrete cube. 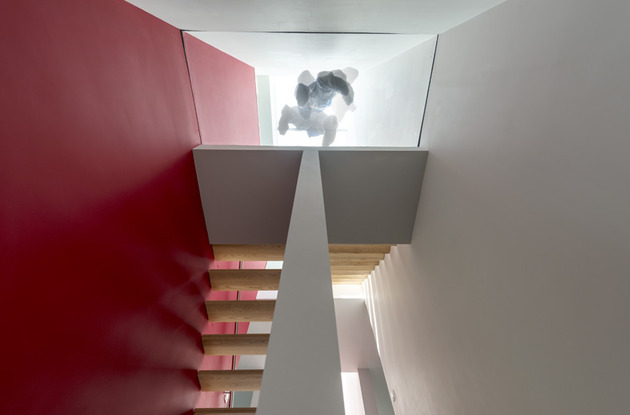 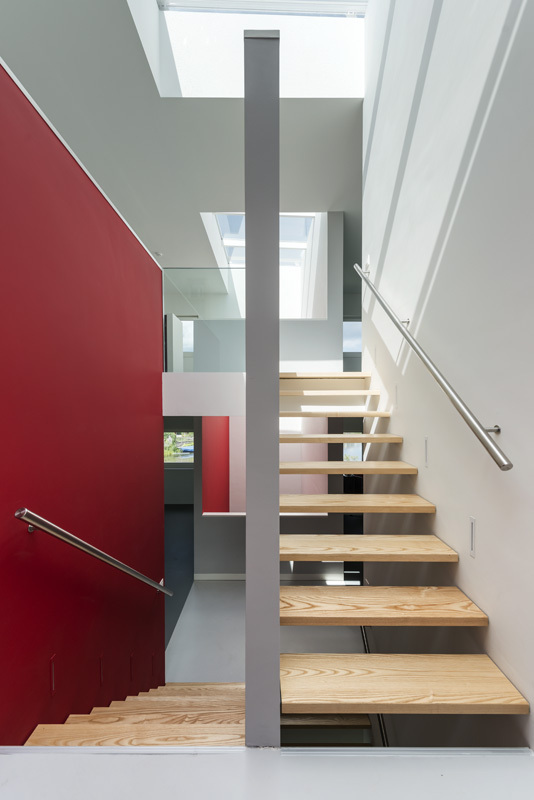 As to underline the importance of the staircase, the wall that hold the stair are painted red. 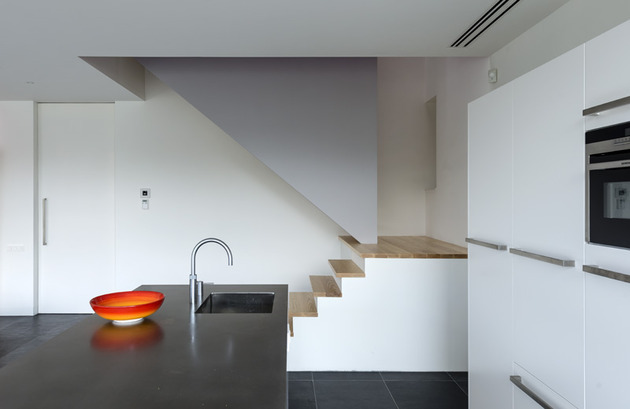 The upper floors have balustrades rather than full height walls, in order to create a feeling of open space and to let the light flow freely. The bathroom is very modern and minimalistic as well. 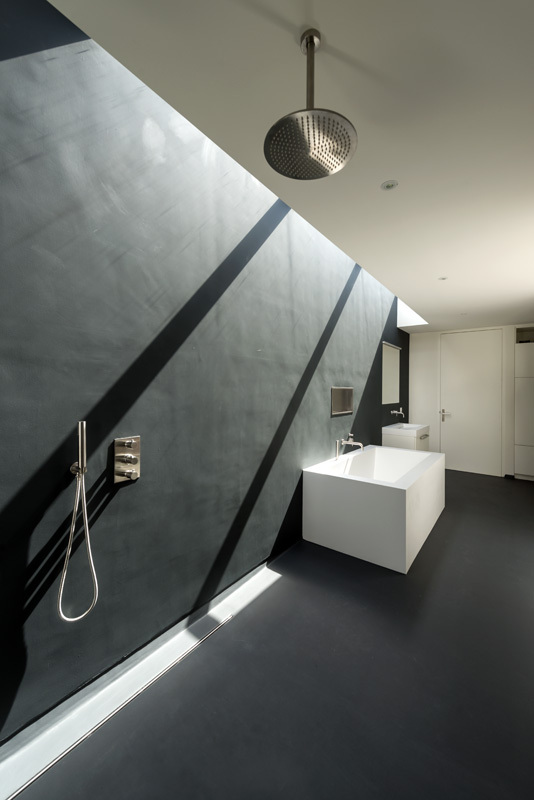 The floor and walls are covered in an anthracite joint- less waterproof waxed cement. 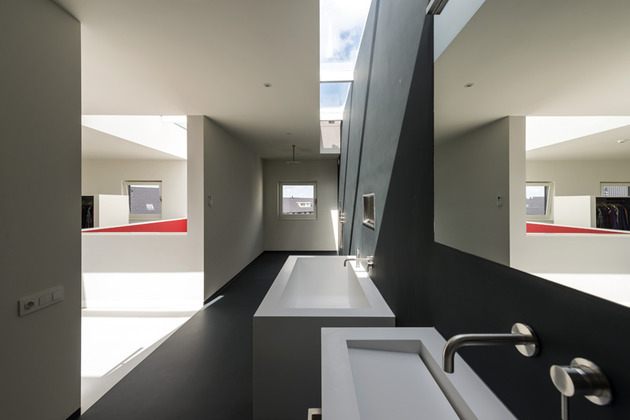 The tub and sink are massive blocks and the overhead shower has no enclosure.